The Oconee County Board of Commissioners on Tuesday night approved the agreement with Fairway after a brief executive session with County Attorney Daniel Haygood. The BOC had approved the agreement in general terms on Oct. 9 of last year, allowing Fairway to fill in the third side of a triangular billboard previously approved by the county, but the signs to be removed as part of that agreement only were identified by the action on Tuesday night. The massive, triangular sign towering 60 feet above the ground already is under construction next to the building housing a Verizon store and Starbucks and is a companion to a similarly-sized sign a short distance away over the building in which PeachMac is located in the Markets at Epps Bridge. Both signs are illuminated with LED lights and can change images quickly and repeatedly. Both signs–as well as the agreement to allow for the third side–were the result of a settlement of a lawsuit filed against the county by Fairway in the U.S. District Court for the Middle District of Georgia Athens Division in September of 2011. The suit challenged the constitutionality of the county’s sign ordinance as well as the way the county administered the ordinance. As part of that settlement, Fairway received permission to erect three signs, two of them on Epps Bridge Parkway and one in Butler’s Crossing, and to remove three of the company’s six billboards along U.S. 441. It also agreed to withdraw three additional sign permit applications it had submitted to the county and not to seek any new sign locations in Oconee County for five years. The BOC action on Tuesday night extended the settlement agreement by allowing Fairway to fill in the triangular sign in exchange for removing the old signs on U.S. 78 southwest of the S.R. 316 interchange. The county had issued the permit for the sign at the Oconee Connector Extension and Epps Bridge Parkway intersection on Dec. 21. The property on which the sign is located is owned by Wright Land Company. 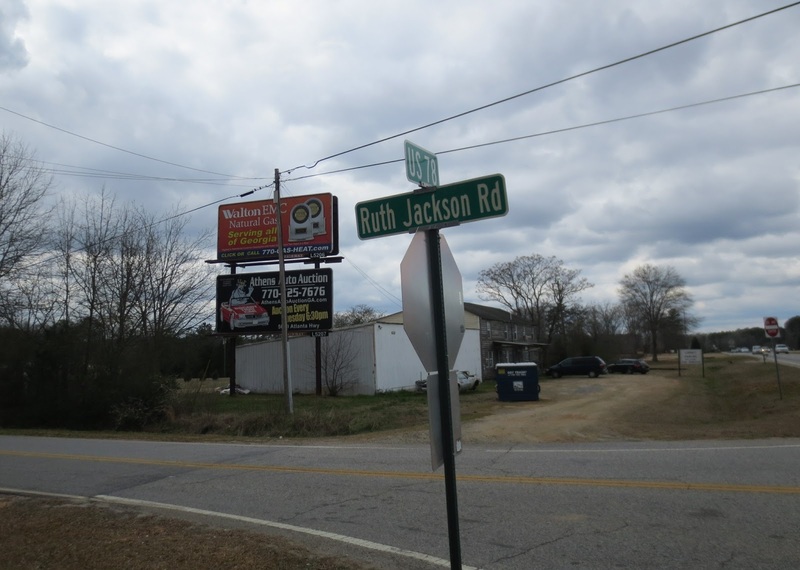 County Attorney Haygood told the BOC in October that Wright Land Company had requested that the sign be altered so that the open end of the V-shaped sign could be covered. J.L. Wright Jr. and Rod Wright are CEO and CFO respectively of Wright Land Company, according to the Georgia Secretary of State corporate database. The Wrights did not want the interior of the sign to be visible to the public, Haygood said. The Wrights also own the undeveloped property behind Lowe’s, and the third side of the sign faces that property. The two signs are easily visible once drivers cross SR Loop 10 on the approach to the busy Epps Bridge Parkway shopping area. Both signs are 14 feet tall and 48 feet wide. The three-sided sign is valued at $350,000, while the sign at the Markets at Markets at Epps Bridge is valued at $200,000, according to the sign permits. 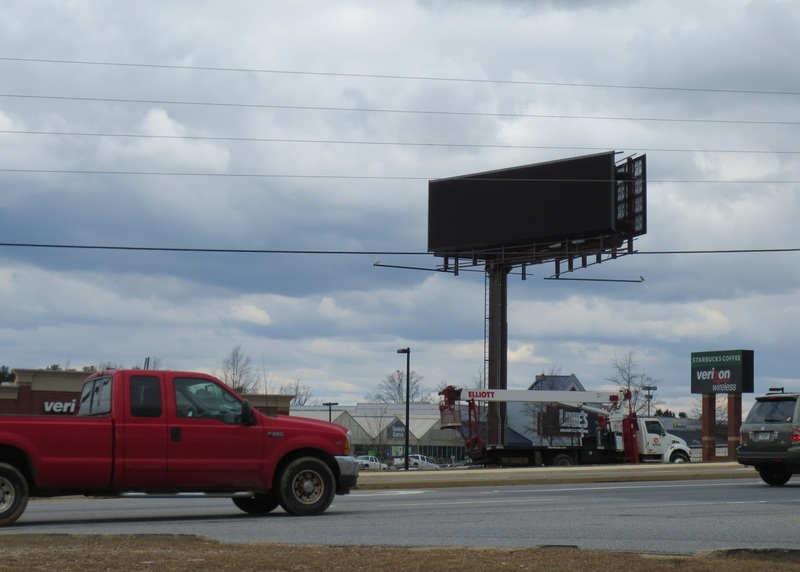 Fairway Outdoor Advertising is located at 3420 Jefferson Road in Athens-Clarke County. All pictures shown here were taken today. Click on any of the pictures to enlarge it. I would like to point out a few facts about this whole thing that seem to go unreported. First, the billboards that Fairway is “trading” for the five large digital boards are far smaller poster size boards. These are approximately 10‘ x 22’. The large digital boards are 14’ x 48’, or about three times larger. Second, the posters are in far lower traffic locations and go for a tiny fraction of the price of the digital billboards, so it would appear that a fair trade would have been based on a value for value equation, leading to Fairway having to sacrifice about ten posters for each billboard. The most significant issue I have with putting these monstrosities on Epps Bridge Parkway is that all of us who have businesses on Epps Bridge have to live with with very strict signage requirements which is why all the signs on Epps Bridge are fairly modest, even those belonging to WalMart and Lowe’s. Yet somehow, Fairway, a business that pays no sales tax to Oconee County, almost no property taxes and creates no jobs, gets to put five enormous digital billboards right in the midst of the largest retailers in the county. Retailers who pay a vast sum in property and sales taxes, and who generate hundreds and hundreds of jobs. Let’s dig a bit deeper into the financial aspect of this deal. These billboards rent for a wide range of prices, but we have been told that the Epps Bridge ones will go for about $2,500 a month. There are six advertisers on each sign and there are now five signs. That works out to $75,000 a month of board rental just on Epps Bridge. Fairway is asking for twenty year leases for the board locations which means that they will generate the staggering sum of $18 million over twenty years, and that assumes no rate increases. Oh, and let’s not forget the two boards Fairway will place at Butler’s Crossing. That’s another $7 million. What does Oconee County get from the $25 million? Zero. Nada. Nothing. Meanwhile, Fairway merged with Olympus Media last month forming the fourth largest outdoor advertising company in the country. Is it just me, or does something stink about this whole deal? Definitely stinks. County got hoodwinked on this one. Big corporation beats small time government. I think the billboards are horrible. If Fairway were a business I could shop at, I would never visit them. The first time I saw the billboard, I was so shocked and angered, and now reading about the additional billboards makes me sick. A quick search of the Oconee County Tax Commissioner site shows 3 accounts for Fairway in the amounts of $89,936.68, $6735.31, & $3062.87. All have been paid for 2012. These bills would have been based on the January 1, 2012 values. The 2013 values should see an increase, but it based on what was in place as of January 1, and not what they may have erected during the year. I hate the signs too, but lets not spread false rumors. No problem for me any more with those hideously monstrous signs. I was getting so furious every time I drove past, that I've decided to avoid that route all together. I'm slipping in to Clarke County the back way from now on...totally avoiding Epps Bridge. My apologies to the businesses at Epps I will no longer be patronizing. You can blame the sign company. I'M SIMPLY REFUSING TO LOOK AT THOSE BOARDS!!! !